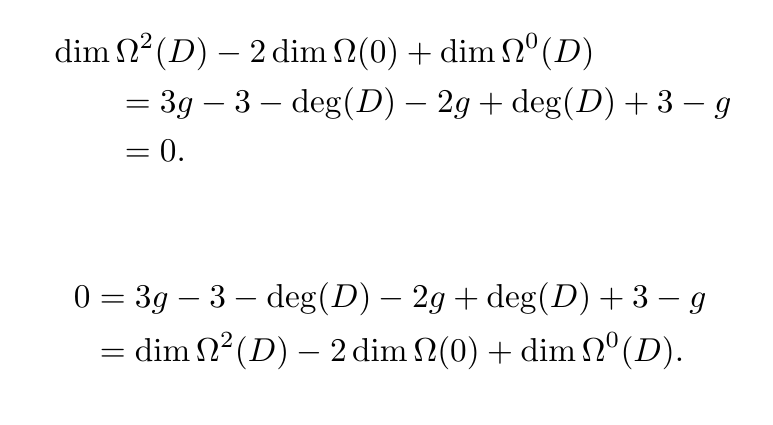 So what's the best way to display this multiple equation? Is there any book which has tips how to display multiple equations in a more easy reading elegant way? Remark: This question is not about the environments (multline, align, etc.) themselves. Since Latex writers have to deal with this kind of problem quite frequently, maybe some of you have some tips or sources to share. 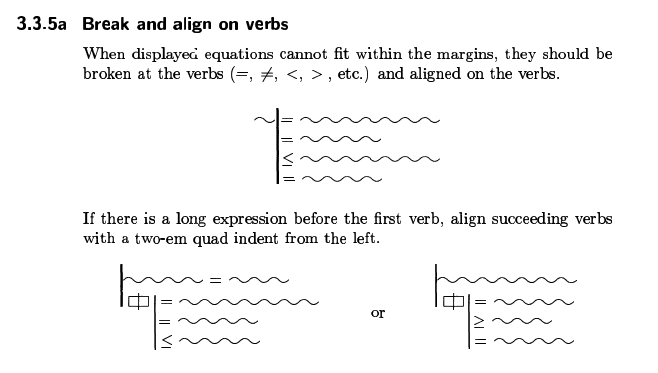 In the first option I followed the alignment suggested in the figure to the right of the second schema; since the expression before the first verb is indeed long, succeeding verbs are indented with a two-em quad indent. The other approach is to reverse the order and start with the zero, using the format presented in the first diagram; this, however, might not be the best approach since it "spoils" the intended implicit expectation that the final result is zero. As a final remark, let me give some reason why I think both the proposals you made in your question are not convenient: in both cases the blank space to the left of the second line is excesive. Not the answer you're looking for? Browse other questions tagged math-mode typography or ask your own question.